Last month we told you about Android USA (that's an American company that makes wristwatches, and has nothing to do with the Android OS or Google) preparing their own branded smartwatch, which may or may not also run Android. Well Android's smartwatch is now available on the designer deal site Touch Of Modern, and it's already 50% off. Sort of. See, Android USA still isn't technically selling the smartwatch on its own yet - all five colors of the watch are still in the pre-order stage on Android's web store, so Touch Of Modern is technically the exclusive retailer at the moment. I say technically because the deal site doesn't use a conventional shipping model, and it'll be 3-4 weeks before the watches actually go out to customers. (All watches will ship when the initial "sale" ends on December 16th.) If you want to order one, you'll also need a Touch Of Modern account - the site is one of those newfangled invite-only stores, but they seem to let just about everyone in via the standard signup page. Then there's the price. If you look on Android USA's pre-order pages, the "Smart Watch GTS" has a retail price of $400 - higher even than Samsung's Galaxy Gear, double the price of Sony's Smart Watch 2, and not quite three times the price of the Pebble. Touch Of Modern is selling the "SmartWatch™" (really?) for $199, technically half off the MSRP, though the store lists that figure at $375. 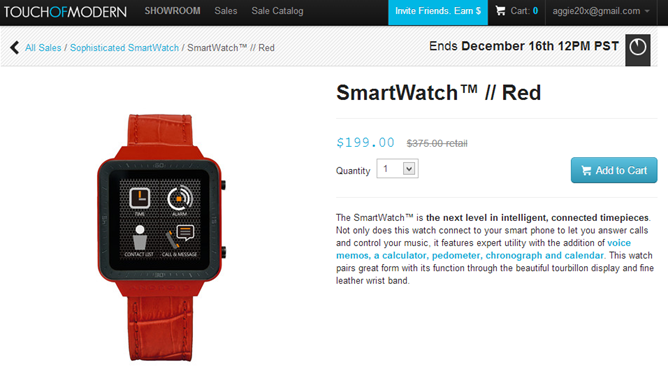 It's currently available in red, purple, or orange with a matching leather strap. And we still know very little about the watch and its capabilities. The Touch Of Modern listings mention a pedometer, voice memos, calculator, standard watchy stuff like a clock and calendar, and four-day battery while in "sleep mode," and the promotional videos show multiple watch faces, music control, call accept/reject and speakerphone capabilities. But we still don't know what operating system it's running, any of its internal hardware aside from a TFT screen, or if it needs any special smartphone hardware like Bluetooth 4.0. 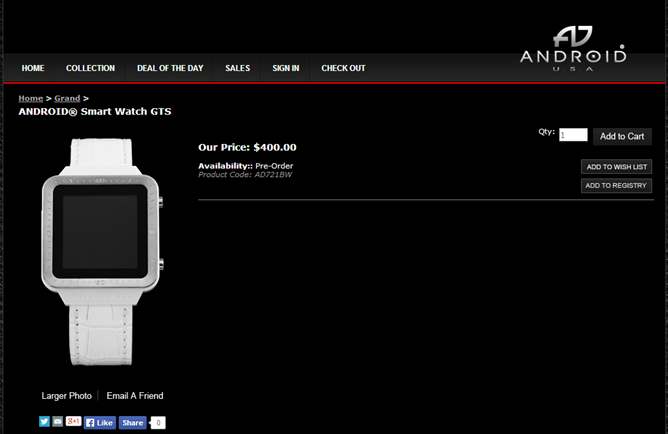 It seems like Android USA is hoping to sell this thing on its merits as a watch and not as an electronic device. The description says that the watch is 1.3cm thick, which is chunky even by the rather expansive standards of smartwatches. There is an app available - it's on Android USA's site as a direct APK download, with a side-load necessary to get it working. All told, Android is asking its potential customers to take a lot on faith for $199, and a lot more for $400, if the phone is ever actually sold at that price. I'd say that Sony's color watch or Pebble's e-paper alternative are better picks, if only because you know what you're getting. The Air Jordan 16 originally released more than 15 years ago (March 2001). This November, the shoe makes its return coming in the OG Midnight Navy colorway. The last Jordans for sale time we saw any kind of version of the shoe was back in 2008 when the Black Air Jordan 16 released as a part of the CDP where Jordan 13 it got paired up with the Air Jordan 7. Fun fact about the shoe, it was also the first Air Jordan since the Air Jordan 3 that was not designed by Tinker Hatfield.This colorway is said to be a nod back to Jordan’s playing Jordan 12 Shoes days with his second NBA team, the Washington Wizards. The shoe comes dressed in a White tumbled leather upper accented by the Midnight Navy patent leather toe which also includes a Navy mesh underlay resting on top of a translucent outsole. One of the most recognizable features on the shoe Lebron Shose is the removable shroud that helps give the shoe two different looks. The Air Jordan 16 Midnight Navy is expected to return on November 5, 2016 for a Jordan 7 Shoes retail price of $250. The Air Jordan 1 High OG Storm Blue just arrived at select stockists overseas, although, its suggested release date nationwide is set for December jordan 11 retro bred 23.Featured in its GS sizing, the basketball sneaker is essentially draped in the original and simplistic two-tone colorway of white, and the defining hue of storm blue throughout Jordans for sale its premium leather construction. Notable details include Nike Air branding adorning the tongue and insoles, as well as the signature wings logo evidenced across its ankles to round Lebron James Shose out its overall makeup.Suggested retail price for adult sizes are listed at $160.Click and bookmark our Air Jordan 1 High OG Storm Blue launch page now for further Cheap Jordans release updates, the latest images and more.